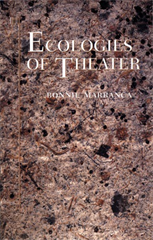 In this ground-breaking collection of essays Bonnie Marranca elaborates a new perspective on performance that links ecology and art practice. She writes on the play of landscape in Gertrude Stein’s theatre and the mus/ecology of John Cage. In the work of Robert Wilson she traces his dramaturgy as an ecology. There are also essays on the opera of Meredith Monk and the spiritual style of Maria Irene Fornes, on Spalding Gray’s solo performances and Rachel Rosenthal’s autobiology. and the natural history lessons of Heiner Müller. Other essays on world events and cultural forms of expression offer a global perspective on contemporary performance ideas.